Three proposals for separating the Great Lakes from the Mississippi River watershed could block the flow of aquatic invasive species while re-envisioning water management in Chicago, a new study says. 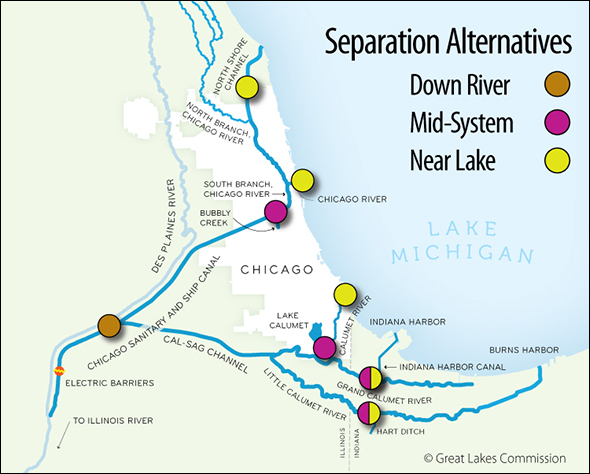 The three separation alternatives include a down-river single barrier, a mid-system alternative of four barriers on CAWS branches between Lockport Lock and Lake Michigan; and a near-lake alternative of up to five barriers closest to the lakeshore. Watershed separation in Chicago is the only permanent solution to stopping harmful aquatic invaders like Asian carp from entering the Great lakes, according to a study released on Tuesday by the Great Lakes Commission (GLC) and the Great Lakes and St. Lawrence Cities Initiative. The report outlines three scenarios, ranging in price from $US 3.26 billion to $US 9.54 billion, which would place physical barriers within the Chicago Area Waterway System (CAWS) to reverse the flow of the Chicago River and separate the Great Lakes from the Mississippi River watershed. The plans would require significant infrastructure changes to accommodate shipping, wastewater and flood waters. These changes would be implemented in two phases, with the first completed by 2022 and the second by 2029. If successful, the project could save $US 1.4 billion to $US 9.5 billion in invasive species control and damage costs, as well as protect the estimated $US 7 billion sport-fishing industry in the Great Lakes. Supporters of the idea say it will also modernize Chicago’s shipping facilities, as well as improve water quality and flood protection. Harbor for recreational and commercial tour boats on Lake Michigan. *Cost depends on wastewater treatment requirements. **All proposals include flow augmentation to prevent stagnant water, increased floodplain storage on the North Branch of the Chicago River, dry docks, green infrastructure in the Tunnel and Reservoir Plan service area, and transfer facilities for cargo and recreational boats. Asian carp, which devastate aquatic food chains by eating huge amounts of plankton, have infested numerous tributaries of the Mississippi River, including the Illinois River, and are threatening to get into Lake Michigan through a shipping canal near Chicago. Before any construction can start, the U.S. Army Corps of Engineers must complete its own study, due in 2015, on separating the two water basins, Brammeier said. Five Great Lakes states are suing the Corps of Engineers in federal court in an attempt to speed up the government study. “The earliest that separation could happen would be 10 years from now but would most likely mean 17 years or even longer,” Mark Biel, chairman of UnLock Our Jobs and executive director of the Chemical Industry Council of Illinois, said in a statement responding to the GLC study. UnLock Our Jobs represents citizens, businesses and industries that want to keep the CAWS open for shipping while pursuing other means to stop Asian carp. “Shutting down this one multi-billion dollar transportation route does not even address the 18 other waterways in and out of the Great Lakes that could serve as entry points for invasive species,” Biel said. According to UnLock Our Jobs, separating the CAWS from the Great Lakes would harm shipping through the locks, which account for $1.9 billion in economic activity and more than 17,000 jobs in the region. To accommodate shipping and transportation, the separation barriers proposed by the GLC study would include recreational boat lifts and intermodal transfer facilities for cargo. Want to stop the Asian Carp? Stop peeing into open waters, as this waste, not only exerts an oxygen demand, but also is a fertilizer for algae, thus provide food for the carp. Time to force EPA to implement the Clean Water Act as it was intended and this can only be done by correcting an essential water pollution test that caused the failure of the CWA.